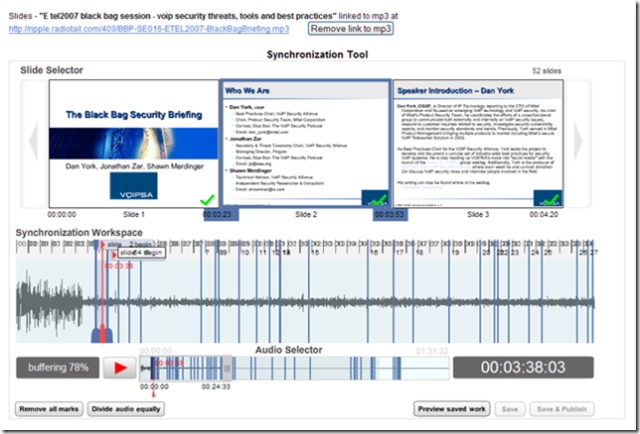 Have you ever heard a podcast or recording of a presentation and wished you could see the slides or materials that went along with it? Or perhaps even worse - you have the slides, but you wish you could know when the speaker advanced to the next slide? Wouldn't it be great if there was some way you get the audio synced to the slides? Click on Edit and then the "Edit Slidecast" tab. Use the synchronization interface to indicate the beginning and end markers for each slide. Preview (if you want) and then publish. (If you are incredibly impatient and can't wait the 3 minutes, you can click the arrow button to advance to the first slide and then you'll see the slide movement.) Other examples are also available on the blog of SlideShare CEO Rashmi Sinha. You simply click on the slide you want to sync, starting with the first one, and then adjust the start and end markers with the mouse. You can obviously play the audio (shown by the red line on the image) and then sync the slides as you go along. Very easy to do. It's all AJAX/Flash/etc. so it just works in a standard browser. Kudos to the SlideShare team for making it as easy as it is. The interface will still evolve, too. During the beta period (I was a participant), there were some issues found. 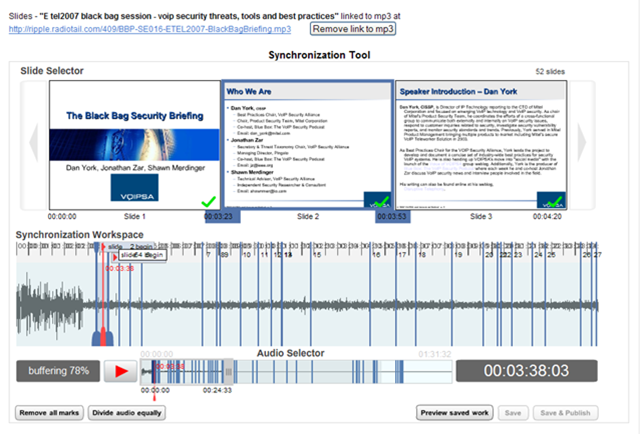 For instance, I would very much like to sync the audio for my "Black Bag Security Review" presentation since it is a presentation that really needs syncing with the audio to make sense. However, the slide set is 243 slides in about 15 minutes, which works out to about 3 seconds a slide. In many cases the transition is about 2 seconds! However, the user interface only allowed for the smallest interval to be about 5 seconds. For 99% of presentations out there, that's probably perfectly fine... for this "story" presentation, though, I need that shorter time. The SlideShare folks are looking into what can be done, so hopefully I'll be able to get that out there soon. In any event, the slidecasting interface will apparently be made available to all SlideShare users later today and it will be very interesting to see what people do with it. For me, given that I speak at conferences and also record my presentations and put them out as podcasts, it's a wonderful way to sync the two pieces and give people who could not attend a bit closer of a view of how the presentation went. I could see this being used for corporate presentations... for training materials, etc. I imagine one the primary uses may be conferences that record the speakers and then want to sync them to slides. A criticism, of course, is that you could just take this type of material and create a video out of it. Either directly record the presentation and slides using a video camera, or use a tool like Camtasia to create a "screencast" of a presentation and then upload the resulting video somewhere. That's certainly true... although I would wonder if screencasting tools are out there that sync the audio with slides as nicely as this. Obviously you could have the presenter doing the recording on the PC and moving through the slides, which would result in a great screencast. However, this does involve the presenter being involved with the recording, whereas the SlideShare slidecasting capability can take the audio from a presentation and have it be synced to slides much later. What do you think? How do you see this service being used? What would you use it for? Do you currently use other services?